WASHINGTON – Published on: Mar 27, 2019 @ 16:07 – The U.S has stated that it intends to spend up to five hundred million dollars to change the government in Venezuela, Secretary of State Mike Pompeo said. “The budget bill requests (from Congress) new moneys to support the democratic transformation in Venezuela, including the transfer of up to $ 500 million to accounts intended for foreign aid,” Pompeo communicated to Congress in a written testimony. In addition, the Secretary of State said that the main priority of the budget of the United States is the fight against the “pernicious influence” of Russia in Venezuela. Today Pompeo spoke at a meeting of the Appropriations Committee of the House of Representatives. He justified the budget request of the administration of Donald Trump for the next financial year. However, there’s a twist here that may reveal something about how the U.S elites presently view the viability of regime-change policies in Venezuela. The request in fact would require a cut in funding for related State Department programs by more than 20 percent to cover the cost, but Congress is unlikely to accept such a significant cost cut to other programs. It appears that the U.S is backing off of public expenditures on measures which it deems unworkable. In late January, a wave of U.S financed protests against President Nicolas Maduro rolled through Venezuela. 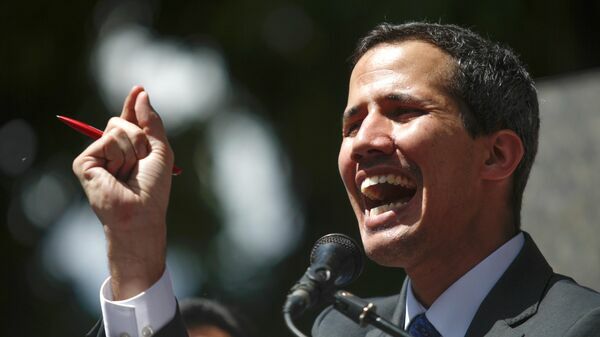 On the 23rd of the same month, amid the unrest, the head of the opposition-led parliament of Venezuela, Juan Guaido, illegally declared himself head of state. This step was approved by the United States and some other countries. Maduro was supported by Russia and a number of other countries, including Mexico, China, Turkey and Indonesia. Moscow called the “presidential status” of the Guaido non-existent.